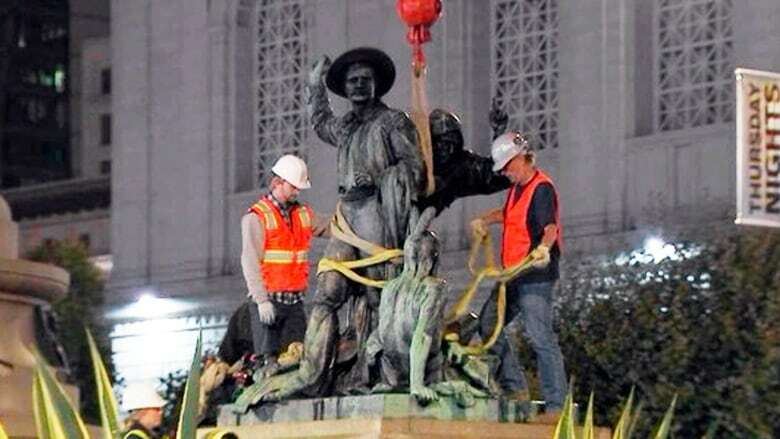 A 19th century statue near San Francisco's City Hall that some said is racist and demeaning to Indigenous people was removed Friday and put into storage. Panel: What should be done about controversial historical monuments? The San Francisco Board of Appeals on Wednesday voted unanimously to remove the statue, which had been in its location for 124 years. "I think we're witnessing a moment in history where, commendably, San Francisco officials are doing the right thing to help rectify the mistreatment of Indigenous people," Janeen Antoine, who is of Lakota heritage, told the San Francisco Chronicle. "We're very happy this is finally happening after decades of work and struggle from the native community." The statue will stay in storage until officials decide what to do with it, said San Francisco's Arts Commission spokeswoman Kate Patterson.